Watterson family, please don't sue me. I'm not really a big fan of these visual Think Kit prompts as I am not an artist. So, don't expect much in the way of originality. If you recognize this self-portrait as Calvin's dad, you'd be correct. I found a favorite Calvin and Hobbes strip with Calvin's dad and intentionally copied it, adding a little more hair and a beard to make it resemble a self-portrait. 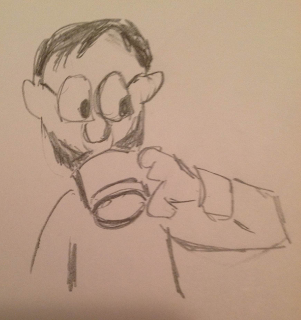 I deliberately chose to copy Calvin's dad as my self-portrait for a number of reasons. First, I grew up reading the strip and it left a lasting impression. Bill Watterson's comic was a favorite of my grandfather Ford. I remember the collected books and newspaper clippings around my grandparents house. I'm really lucky to have this strong association. I also chose to copy Calvin's dad because I want my kids to have the life of Calvin and Hobbes. I'm going to ensure there's uncontrollable imagination and years-ahead-of-its-time awareness and wit. I'm going to nurture yet be a gentle disciplinarian, like Calvin's dad. My children are going to need cleverness and intellect to keep them engaged and ensure their success. This is who I am consciously visualizing myself to be, Calvin's dad.